This gene encodes a member ofThe KDEL endoplasmic reticulum protein retention receptor family. Retention of resident soluble proteins inThe lumen ofThe endoplasmic reticulum (ER) is achieved in both yeast and animal cells byTheir continual retrieval fromThe cis-Golgi, or a pre-Golgi compartment. Sorting ofThese proteins is dependent on a C-termil tetrapeptide sigl, usually lys-asp-glu-leu (KDEL) in animal cells, and his-asp-glu-leu (HDEL) in S. cerevisiae.This process is mediated by a receptor that recognizes, and bindsThe tetrapeptide-containing protein, and returns it toThe ER. In yeast,The sorting receptor encoded by a single gene, ERD2, is a seven-transmembrane protein. Unlike yeast, several human homologs ofThe ERD2 gene, constitutingThe KDEL receptor gene family, have been described. KDELR3 wasThe third member ofThe family to be identified. Alterte splicing results in multiple transcript variants. [provided by RefSeq, Jul 2013]. 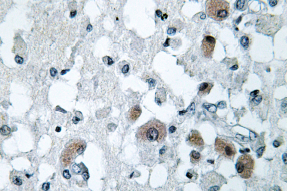 Immunohistochemistry (IHC) analyzes of KDEL Receptor 3 antibody (Cat.-No. : AP01401PU-N) in paraffin-embedded human brain tissue. 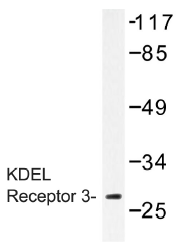 Western blot (WB) analysis of KDEL Receptor 3 antibody (Cat.-No. 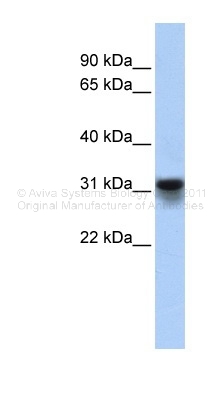 : AP01401PU-N) in extracts from 3T3 cells. 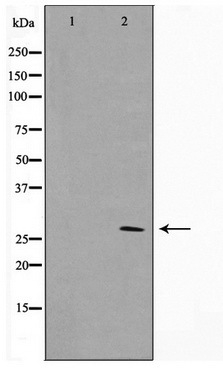 Western blot analysis of extracts from NIH-3T3 cells, using ERD23 Antibody. The lane on the right is treated with the synthesized peptide.